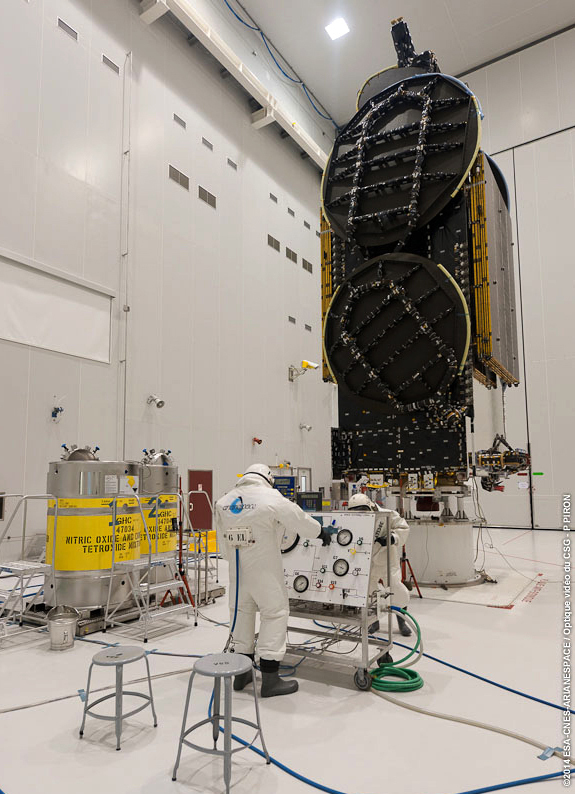 The DIRECTV-14 satellite has been fueled at the Spaceport as preparations continue for its launch on Arianespace’s upcoming Ariane 5 mission – which is scheduled for liftoff in early December, with India’s GSAT-16 as the co-passenger. DIRECTV-14 receives its propellant load inside the S5A fueling and integration hall of the Spaceport’s S5 payload preparation facility. Built by SSL (Space Systems/Loral) for operator DIRECTV, the high-capacity spacecraft received its propellant load in the S5A fueling and integration hall – with this activity coming after DIRECTV-14’s fit-check process performed earlier this month in the Spaceport’s S5C clean room facility. Based on the SSL 1300 platform, DIRECTV-14 is a 20-kilowatt class Ka-band and reverse-band digital broadcast satellite that will be used to deliver Ultra HD and other new consumer services for DIRECTV. It was designed with a very advanced beam forming network to provide service across the U.S. and Puerto Rico. DIRECTV-14 will be joined on the flight by the Indian Space Research Organisation’s (ISRO) GSAT-16 telecommunications satellite – which also is being readied for launch at the Spaceport, and is designed to provide telecommunications services that include VSAT transmissions, TV broadcasting and emergency communications. Ariane 5’s early December mission with DIRECTV-14 and GSAT-16 is designated VA221 in Arianespace’s numbering system for its family of launchers.